Chonburi, 29th August 2018 – Khao Khiao Zoo has denied that one of its elephants was mistreated by a mahout, following a foreign news report claiming a bull hook was used to force the animal to swim. 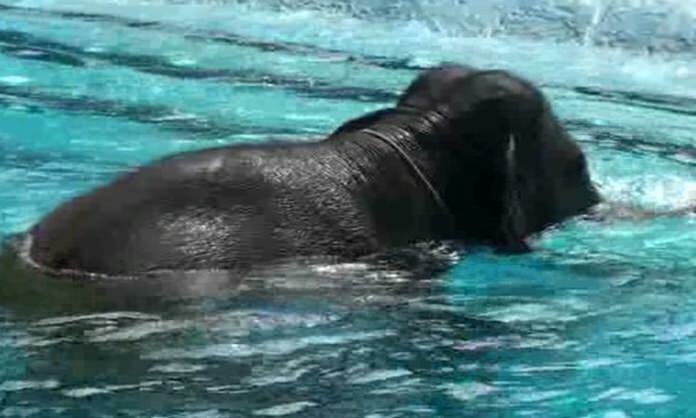 Khao Khiao Zoo Director Attaporn Srihayrun denied the report saying no elephants are harmed during their daily 10-minute swim, adding the animals enjoy being in the pool with their trainers. Swimming is part of the elephants’ daily exercise in addition to a morning walk. Zoo-goers are able to observe their activities up close. Visitors can see them swim twice a day at 10.15 a.m. and 2.15 p.m. at the zoo.